So what’s the deal with these copper grill mats? I ordered several different brands and the first thing I did was test them for copper content. We started with a coffee can forge, which gives us temperature in excess of 2,000 degrees. This is hot enough to melt copper and incinerate the other ingredients in a mat. We incinerated several copper grill mats with the forge, and there was not so much as a drop of copper in any of them. That’s right, there is no copper in a copper grill mat. 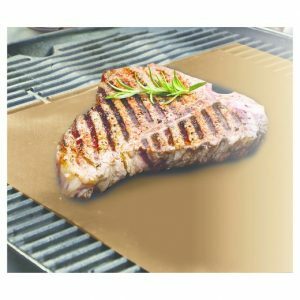 So, when they refer to a “copper” grill mat, they’re NOT talking about copper, the element – they’re talking about copper, the color. In other words they’re copper-colored grill mats, not actually copper grill mats. 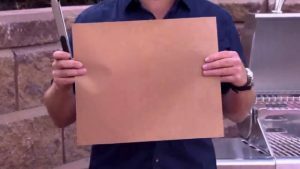 In defense of the companies selling the copper grill mat, as far as I know, they aren’t claiming that the mats contain copper. They just call them “copper grill mats” in reference to the color and leave the rest to the customer’s imagination. That being said, it’s pretty clear why someone would want you to believe they contained copper. Copper is the best metal for conducting heat; plus it’s extremely durable and corrosion resistant. You’re probably familiar with Revere Ware pots and pans that have a copper bottom and a stainless steel top? That copper on the bottom of the pan quickly absorbs and distributes the heat. In fact, copper conducts heat five times more effectively than cast iron and over 20 times better than stainless steel. So it’s a common practice to use copper for many culinary applications. But, once again, that is immaterial in this case, since the copper grill mats don’t contain any copper. Compositionally, they are identical in every way to the traditional black grill mat. 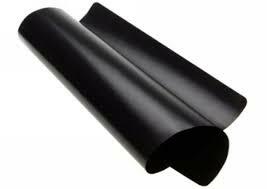 They are constructed the same way with the same nonstick coatings of PTFE. The only difference is that the PTFE coatings are colored gold instead of black. Just the same, I went ahead and did a side by side comparison on the grill – copper next to black. The results were identical on both mats. This was no surprise, since before I started the comparison tests I had already ascertained there was no difference in physical characteristics between the mats. Still, I had to run the tests on the grill just for physical proof. So what this all boils down to, is that you have a choice between a black grill mat and a copper colored grill mat, and it is simply a choice of color, nothing else. if you want to know how a copper grill mat is made you can read my post on how black grill mats are produced, as it’s the exact same process. So in conclusion, when buying a grill mat, focus on size, coefficient of friction, and thickness, same as before, and then pick the color you want.